iPhone 7 is coming with the expectation. Who are using old iPhone maybe want to update their old iPhone 5 to iPhone 7. But is it really a good idea? Is iPhone better than iPhone 6S? It is hard to say. Let’s the comparison between iPhone 7 and iPhone 6S. Which is better? The biggest expected change to the ports of the iPhone 7 are the rumored death of the headphone jack. Instead, users will be expected to plug in their headphones via the Lightning port or use Bluetooth headphones. But if the iPhone 7 does ditch the headphone jack, it may gain a new port: the Smart Connector. Currently this Smart Connector is found on the iPad Pro like and allows smart accessories like keyboards to be attached. It’s possible Apple may be planning a mini-keyboard accessory for the iPhone 7. The iPhone 7 will look almost exactly as the iPhone 6 does. Yeah, that’s a major disappointment to us too. And it’s unexpected (until multiple rumors seem to have confirmed it, anyway) as Apple has always revealed a new design every other product cycle. The only thing that is expected to be different with the iPhone 7’s design is the removal or shifting of the antenna bands that are found on the iPhone 6s. Earlier this autumn the internet freaked out when videos surfaced of the iPhone 6s surviving 30 minutes underwater. It turns out Apple secretly added new adhesive strips inside the iPhone 6s to block any moisture getting in. Now a Chinese Mac blog is claiming that this was just a dry run (get the pun) for Apple, and that the iPhone 7 will officially be certified as waterproof. In addition to waterproofing by using internal gaskets, another Chinese site is claiming Apple will ditch the aluminum casing of the iPhone 6s for an all new plastic material on the iPhone 7 to make sure the device is fully waterproof. We don’t see Apple’s iPhone 7 being a plastic phone, but only time will tell. What’s more there have been plenty of metal waterproof phones in recent months such as the Xperia Z line and Samsung’s Galaxy S7 happily putting to rest the nonsensical old claim that a metal phone couldn’t be waterproofed. The iPhone 6s also gained 4k video recording on the rear camera–something we don’t see changing or expanding on for the iPhone 7. Apple is all about refinement with its imaging technology; it doesn’t bother with arbitrary specs-wars style updates to megapixels or things like laser-guided focus. Instead, it consistently updates the core components of what make a camera good at imaging — optics, lens-technology and software. The company some 800 people working on the future-generations of iPhone camera technology and, for one of the first times, Apple actually allowed Charlie Rose’s film grew inside its secretive R&D labs to see how the company goes about building its iPhone. Other topics under discussion during the TV show were the iPhone, Apple’s aspirations inside the automotive industry and plenty of chatter about how the company and its teams of engineers and designers tackle new projects. The iPhone’s camera features 200 separate individual components. Apple’s imaging design studio is so vast and complex that it can simulate almost every condition imaginable in order to test out the camera technology before it goes to production. Take the iPhone 6s Plus’ imaging prowess, for example. It is pretty much unparalleled in the mobile space at the moment, according to a raft of AV review and testing sites. Despite all that, there’s not many rumors regarding the megapixels of the cameras in the iPhone 7. After all, the iPhone 6s each got a big boost from the iPhone 6. The 6s got a 5MP front camera upgrade and a 12MP rear camera upgrade. It’s possible the iPhone 7 will keep the same megapixel lenses. 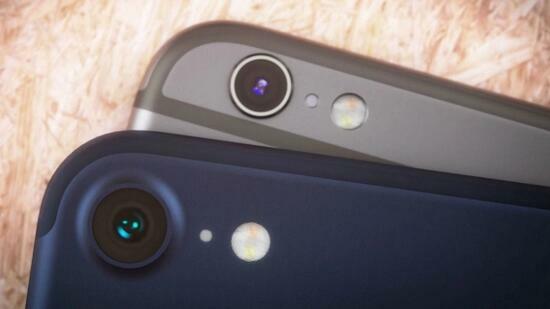 However, the iPhone 7 is expected to get one major camera upgrade: a dual lens rear camera. This would mean there would be TWO 12MP cameras on the back of the device which will take insanely detailed pics. the bad news is that this dual lens system is rumored to be limited to the iPhone 7 Plus, sadly. Obviously the iPhone 7 will be the better phone, but for the first time ever it’s hard to argue that most people should upgrade from their 6s. After all, if the rumors are true, the design will look exactly the same—and while internal spec upgrades, including RAM, CPU, and storage are nice, not everyone needs them. I’d say that a dual lens camera system is going to be game changing on the iPhone 7—and that alone is worth the upgrade—but that will only be for people who like the larger 5.5in Plus model. If you like the smaller 4.7in model it’s hard arguing that the iPhone 7 is a “must” upgrade. How to Rip Blu-ray and DVD to iPhone 6S and iPhone 7 for Watching? No matter which handset you have, they would be a nice tool to enjoy movies on the go. But both iPhone 7 and iPhone 6S have strict limitation for supported format. They only can play MOV, MP4 and M4V video. So if you have plenty of Blu-ray and DVD movies, you can’t stream them on iPhone 6S and iPhone 7 unless you extract MP4, MOV, M4V video from Blu-ray and DVD discs with some Blu-ray ripping tool. Here we recommend you the best Blu-ray Ripper to help you rip Blu-ray and DVD to iPhone 6S and iPhone 7. Here strongly recommends you the unmatchable Blu-ray ripper for iPhone 6s and iPhone 7-Pavtube ByteCopy, which can rip commercial Blu-ray and DVD to iPhone 6S/7 friendly format like MP4, H.264 without any third party help. Better still, this edge-cutting Blu-ray ripper for iPhone 6S/7 is armed with advanced High Quality Engine to ensure you to rip any Blu-ray encoded with VC-1 and AVC to iPhone 7/SE/6S/6S Plus/6/6 Plus/6s/6s plus, iPad Pro/Air 3/mini 4, Android etc with pristine high quality. 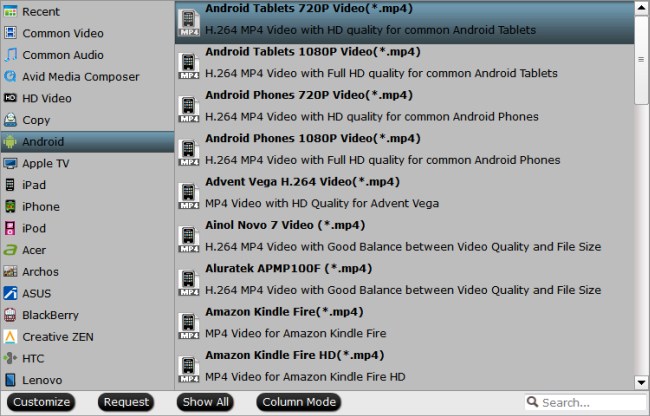 Learn>> more functions of Pavtube ByteCopy. 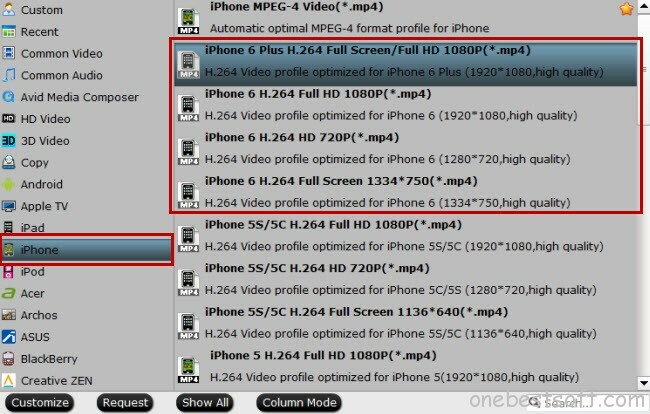 For Mac users, please download Pavtube ByteCopy for Mac. Insert Blu-ray/DVD disc to your Blu-ray/DVD drive, click “Files” to import Blu-ray/DVD disc directly. If you have IFO/ISO and DVD folder, choose the corresponding option to load Blu-ray/DVD movies from your computer. The main title in your Blu-ray/DVD will be checked by default. This App contains an optimized preset format for iPhone 6S/7. All you need is to go to Format > iPhone > iPhone 6 Plus H.264 Full Screen/Full HD 1080P(*.mp4) which is also suitable for iPhone 6S（Plus）and iPhone 7, or select “iPhone 6 H.264 Full HD 1080P(*.mp4)” which is OK for your iPhone 6S(Plus) and iPhone 7. Tip: In order to get better playback, you can click “Settings” bottom to adjust the output parameters, including video codec, size, bitrate, framerate and sample rate(Hz) etc. Click the red “Convert” to start converting Blu-ray/DVD to MP4 for iPhone 6S(Plus) and iPhone 7. 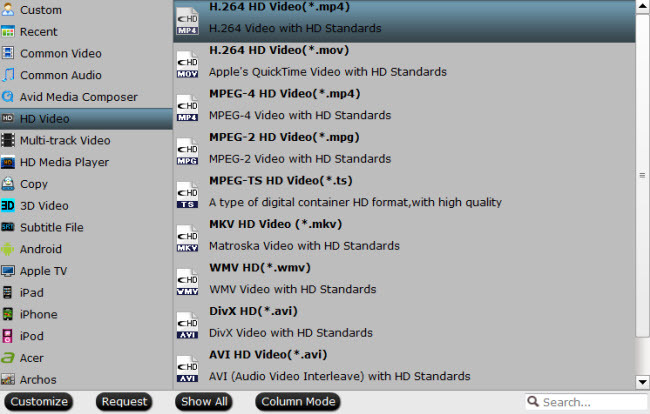 After conversion, you can click “Open output folder” to locate the converted videos. And then, you can transfer the converted movies to iPhone 6S(Plus) and iPhone 7. The current newest version of Android mobile OS is Android 6.0 Marshmallow. And it is now rolling out to many popular and top Android phones like Nexus devices. However, even they apply to the newest OS, Android 6.0 Phone still can’t play DVD movies cause no smartphone has DVD drive. So how to get DVD movies onto Android 6.0 Phone for playing? Android including Android 6.0 phone accepts various video formats H.264, MPEG4, WMV, AVI, MOV, 3GP, etc. However, it cannot play DVD directly. To play DVD on Android 6.0 phone, a DVD to Android ripper is needed. 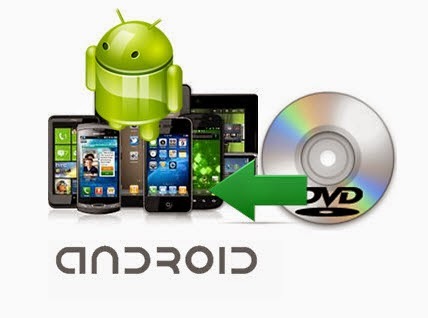 A DVD to Android 6.0 phone converter can extract Android supported digital files from DVD movies. 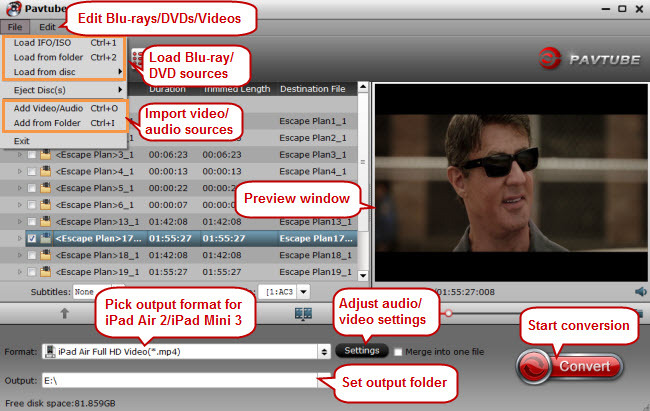 A powerful DVD Ripper also can bypass DVD protection to convert commercial DVDs. If you are using a Mac and want to convert DVD movies to Android 6.0 on Mac, please turn to ByteCopy for Mac. How to Rip and Play DVD on Android 6.0 Phone? Pavtube ByteCopy will detect and list the main title (the full length of this movie with all the chapters) and check it by default. So just keep it untouched and let’s move on to Step 2. Now hit the big red “Convert” to start converting purchased DVD movies to MP4 with best settings for playback on different Android 6.0-based devices. transfer videos from PC to Android 6.0 Phone/Tablet. 1. 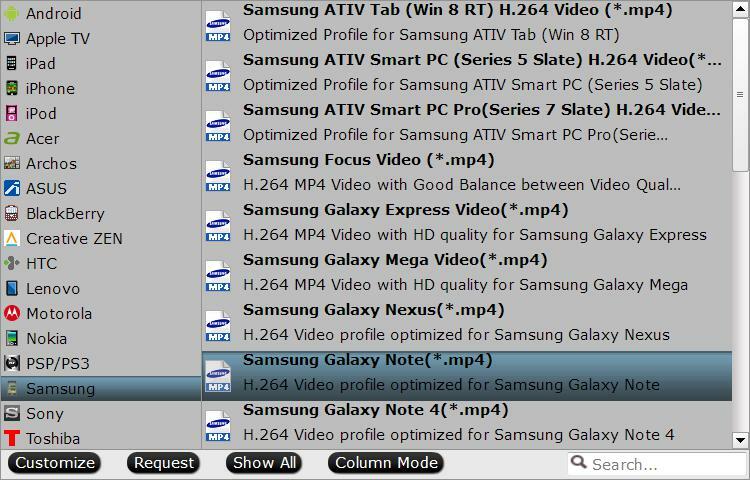 If you have H.265, MKV, AVI, Tivo, VOB, FLV, MPG, DVD, Blu-ray, ISO, IFO, etc. and want to play them on Android tablet and phone, a software can be completely solved, it is Pavtube Video Converter Ultimate. 2. Not a Android users? It doesn’t matter, the Pavtube Converter also supports “common” video formats like MOV, M4V, MP4 and has presets for all the models of iPad, iPhone 7/SE, iPod Touch and Apple TV 4/3, or Surface RT, Surface Pro 4/5, so you should be able to create files compatible with your iOS basd devices and Windows RT/Pro devices.